I’m always on the look out for inspiring artists and Helen Musselwhite is one of those that instantly drew me. Helen uses bold colors, strong graphic lines and familiar images and creates fictional almost fantasy scenes. She describes her work has having a distinctive hand crafted quality with hints of mid century design, folk and ethnic art. I also think it has a fantastic contemporary feel as fairy-tale land is a definite fashion and design trend. …and if it was not, who wouldn’t like to live with unicorns, rainbows, bunnies and all other lovely, harmless and good things. 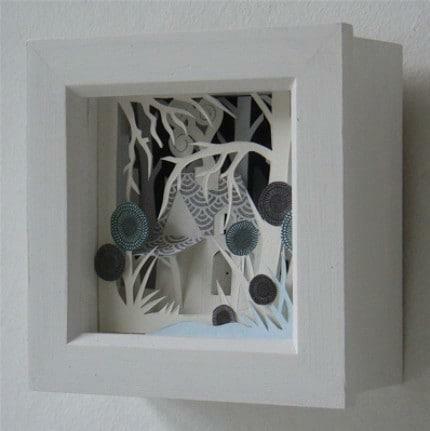 These artworks are hand cut, folded and scored using a wide range of papers and cards and then further worked to create patterned and textured surfaces. Helen then uses this to build scenes in box frames.Â To visit her etsy shop click here. This entry was posted in Blog and tagged 3D, art, box art, bunny art, Design, dolk, ethnic, Etsy, fairy-tale, fantasy, fictional design, hand craft, Helen Musselwhite, Illustration, paper, rabbits, Sculpture, trend, unicorns. What is it about Monet’s Art? Helen must be a good artist. 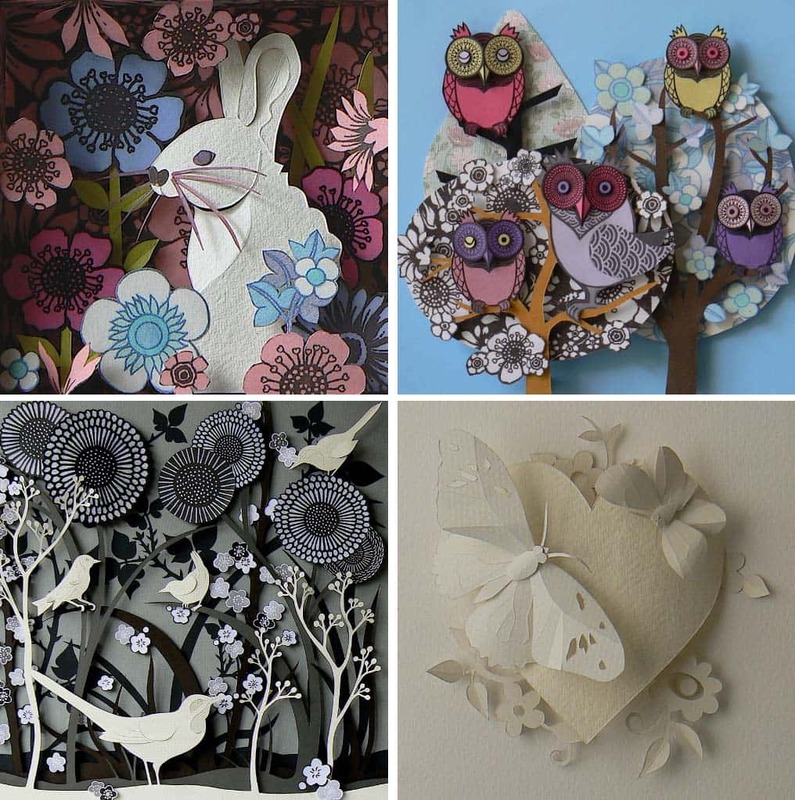 I like her work especially the pics with the owls and the bunny.Great work and nice inspirations. Wow. Her work is absolutely beautiful. Thanks for letting us know about it! This work is lovely! I’m off to check out her etsy shop.